Welcome to The Rubber Cafe/Faber-Castell Design Memory Craft blog hop! If you've just joined us today and would like to start the blog hop from the beginning, simply click on The Rubber Cafe blog to begin. If you've come here from Irit Shalom's blog, you are in the right place! The Rubber Cafe is a stamp manufacturer of high quality, deeply etched stamps and other fine paper crafting tools and accessories. All of our beautiful stamps are made right here in the USA in sunny San Diego, California! Visit http://www.therubbercafe.com today to view their complete product line! Faber-Castell was founded more than 240 years ago in Germany as a pencil manufacturer. Today Faber-Castell is world renowned for its high quality, innovative products. Too see Faber-Castell Design Memory Craft’s complete product line, visit http://www.designmemorycraft.com today! For your next stop on the hop, you'll be visiting Michele Ciola. Faber-Castell Design Memory Craft will be giving away a $50 prize pack, and The Rubber Cafe will be giving away TWO $25 gift certificates! The blog hop contest will be open until midnight June 10th and the winners will be announced on June 12th on the company's blogs. Your projects are amazing! I love the "passport-esque-ness" of the first project ... Happy, Happy, joy, joy, joy! Oh WOW! Love the typewriter project! What a cool new look for that stamp! 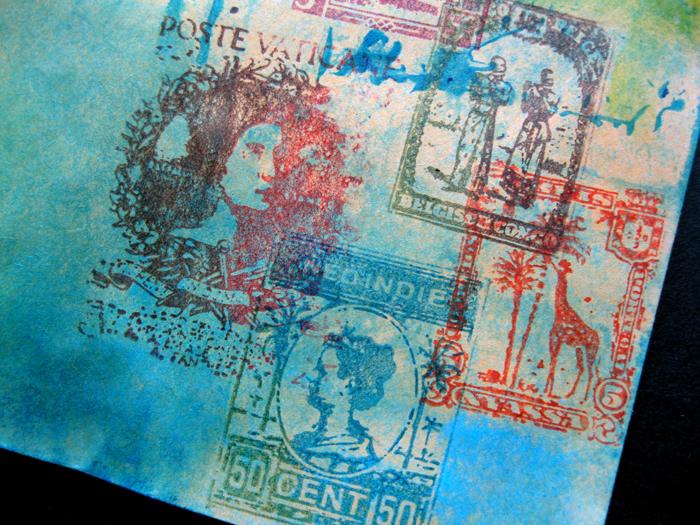 I really love how you encorporated the stamps very inspired! Love, love, love your mail art!!!! Such awesome stamping and coloring, very artsy!!! It's very obvious that you're having a blast with these projects! Thank you for for the inspiration! wow your cards are gorgeous! 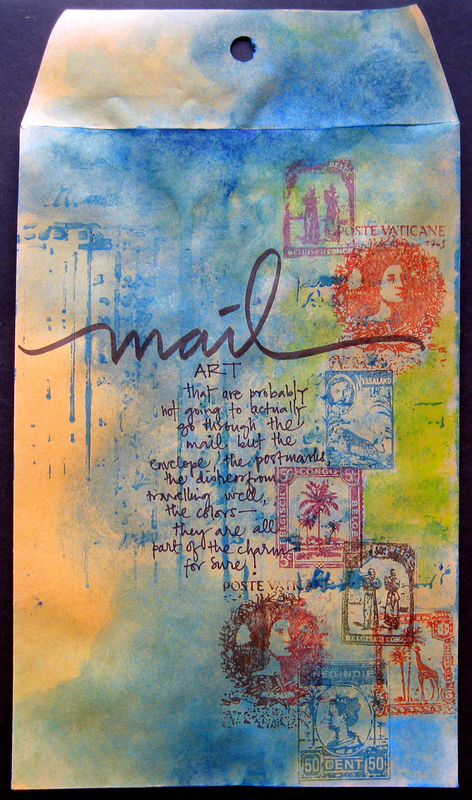 I especially love the mail art, I have a thing about mail love and stamps! I've never seen mail art before, but I'm loving it. i absolutely love your style. Great work. Thanks for a chance to win. LOVE the idea of mail art. How neat! Thanks for a wonderful idea! 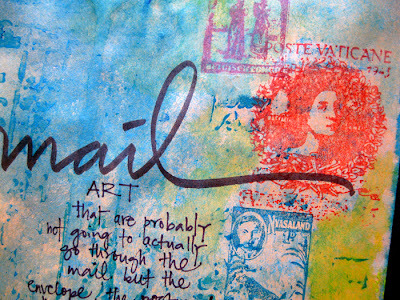 OMG, I LOVE the mail art envelope -- the colors, the stamps, the text. I'm taking an online lettering class right now and just love the way you incorporated lettering into your piece. Wow, your mail art turned out BEAUTIFUL!! Definitely going to go check out the other blogs in the blog hop now. Simply amazing use of loose color. Beautiful. Wonderful projects using these products! Your mail art is so cool. What a great altered envelope! Love all the mail art. TFS!! Wow, so fun. Never thought of mail art! Fabulous ideas on the blog hop, thanks for the inspiration! Love The Rubber Cafe and DMC! You really showcased the products very well in your project. I am inpired. Just amazing. I love how the projects came out. Love the way the typewriter stamps and their background came out. Great theme! Love the typewriter! And the colors! Love love love the watercolor affect! Great envelope project! I have fun giving the mailman a treat! You are so artistic! 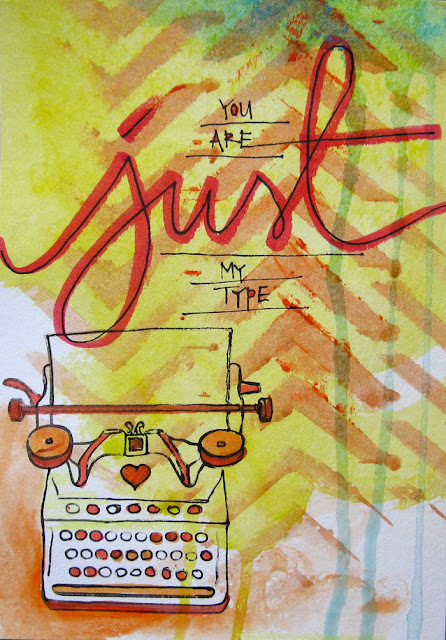 I thought the "Just my Type" stamp was actually your pen drawing and lettering at first... Lol. Anyhow, your projects are great. TFS. luv, luv, luv your mail art. thanks for sharing. I love everything about this, my Only wish is for a tutorial of how you used each product to create it! Love how you took the envelope and then played on the travel theme. Also loved the use of color. Thank you for being part of the blog hop and for the inspiring project! oh yea; that's what i am talking about! oh yea; that's what I am talking about; great job! What wonderful ideas!! Can't wait to get started!! Thank you for the inspiration. I absolutely adore mail art. Who wants to get a plain envelope in the mail? Really loved your mail art and dying to try it myself ! Very colorful. I love the backgrounds you created with gelatos. Nice work. Very clever and fun. Both your projects are wonderful!! I love the big envelope mail art card. Thank you so much. Great projects. Thanks so much for sharing! I love your mail art--fabulousness! What a personal touch to mail art. Thank you for sharing. Amazing! I love use of colors and such an original idea! Thank you for the inspirations! So cool! Love the background you created with gelatos! I'm so happy to see you in this blog hop, Mou! Your creativity is a great inspiration!! I love the vintage stamps images . Very nice way to decorate an envelope. I love your style on the envelope as it is tidy but has a nice loose look. Die Cuts With A View "The Homespun Stack"
Diecuts With A View "A Type of Art Stack"